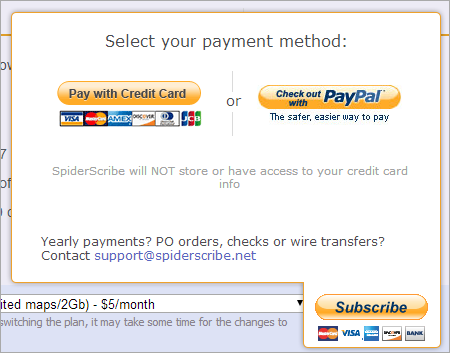 We just added a new payment method for our SpiderScribe subscription plans. Before today all recurring payments were processed through PayPal and required creating/having a PayPal account. Now we added the possibility to process credit cards without leaving our website (through Stripe.com) and without a need to create a PayPal account. As before, SpiderScribe does not store the credit card information and we have no access to our clients credit cards. Also, now the payment information will be requested at the end of the free trial, not at the start. It means you can try SpiderScribe without entering any credit card information.